Being a programmer, I type a lot and I suffer from Repetitive Strain Injury (RSI) and tendonitis on my wrist. I’ve tried many different ways to help make it better. One way to do this is to switch to a different keyboard layout other than QWERTY. QWERTY was supposedly designed for typewriters to solve a very specific problem–to keep the types from jamming against each other. The most frequently used keys were placed apart from each other to prevent them from jamming. This results in a non-ergonomic layout. However, there are alternatives. The first alternative keyboard layout that came to mind is Dvorak. It was created in the 1930’s and promised to be vastly superior to QWERTY. I went ahead and tried it out and soon enough after doing “ls -latr” on the terminal, I had to shake my head and sadly walk away from it. I didn’t like the way Dvorak was laid out especially for the weak fingers of the right hand. 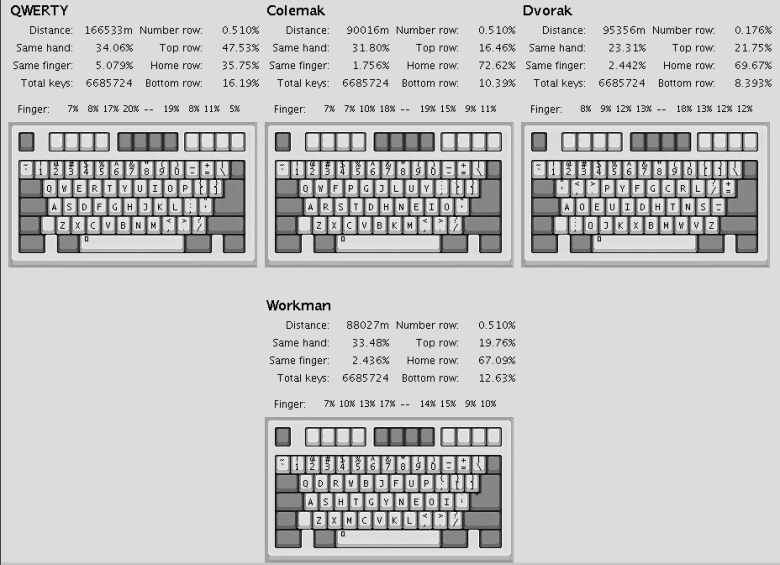 Then I stumbled upon a layout called Colemak, a relatively new player in the game compared to QWERTY and Dvorak. It was released in 2006 and boasted impressive metrics in terms of finger travel, hand alternation, and same finger frequency. Everyone in the alternative keyboard layout crowd seemed to be raving about it. There are other layouts available namely Capewell, Arensito, Carpal X, etc. After some research I decided on Colemak because of its metrics and probably partly because it looked “normal” and “familiar”. The other ones either looked too radical and different or they suffered from awkward placements of some often used letters. Colemak looked the most promising and I was excited to try it. So I went ahead and tried it and immediately it felt good. I noticed that my fingers were not moving up and down as much and most of the time they stayed on the home row. However after a few days of practicing on K-touch, a nagging feeling started to creep in. Something felt rather awkward. At first I thought that maybe I just wasn’t used to it yet and it’s the result of the awkwardness in switching to a different layout. So I kept on and while doing so, I tried to analyze how my hands were moving and then the problem became clear to me. ‘HE’ is the second most frequent bigram in the English language (‘TH’ is the first). It occurs in approximately 8,188 words. You type it approximately once every 26 keystrokes, or once in every 5 words. At 40wpm, you will make this movement 8 times in one minute. More if you are faster. Just ask yourself, how often do you type ‘the’, ‘these’, ‘them’, ‘when’, and ‘where’, etc. on a day-to-day basis? It’s even worse when you’re typing these words in the beginning of a sentence. Try typing “The” with the T capitalized on Colemak and hopefully you’ll see what I mean. Your right hand will move somewhat like this: you swing to the right to get the SHIFT key with your pinky, then you swing back to the left to get the letter ‘H’, and then you move to the right again to get the letter ‘E’. All this is happening in a split second. That’s quite a bit of lateral movement. Now I’m not a doctor, but multiplied over a lifetime, making that sideways motion with the wrists could be detrimental to people’s hands. It’s nothing personal against Colemak. However, I consider this to be a major flaw in Colemak’s design and I’m concerned that nobody is talking about it. And even if it’s proven to be benign, I find it personally cumbersome. The letters ‘D’ and ‘H’ are relatively high frequency letters and placing them in the middle of the keyboard forced the hands to make that lateral twitching move a lot. This is by design since the purpose was to optimize the home row keys for high frequency letters to reduce finger travel, which is primarily caused by moving up and down above and below the home row. Colemak by design, as well as Dvorak tries to reduce use of the top and the bottom rows. Actually, when you think about it, most of the other alternative layouts optimize for this very thing. However, I believe that the way that alternative layouts focus on just the home row for optimization is somewhat misguided. We should optimize the keys inside the hand’s natural range of motion and not just strictly the home row. Other letters that I think are cumbersome with Colemak are the letters G, L, and O. I believe that by moving these letters, horizontal and diagonal stretching could be made less and the load on the right pinky could be reduced. I was really disappointed that Colemak was not the layout that I had hoped it would be. I no longer wanted to use QWERTY. I didn’t like Dvorak, and the other alternatives didn’t look very promising either – but rather very alien. I really wanted Colemak to work however I can’t live with the H-E movement and having to reach for D and H often. I felt that it could be made better. I tried to see if there’s anything that could be done to solve this. At first I ignorantly tried to replace ‘D’ and ‘H’ with other lower frequency letters and moved them elsewhere still expecting the same metrics. I used the awesome Keyboard Compare applet by John A. Maxwell with modifications from Michael Capewell, and also Patrick Gillespie’s amazing Keyboard Layout Analyzer. Long story short, I got pretty crappy results. It soon dawned on me that just moving a few things around isn’t going to cut it. It’s like playing with a water balloon. If you squeeze on one side, it bulges on other sides. If I was going to get the results that I’m looking for, I had to sit down and do some thinking. If vertical folding and reaching cannot be prevented, prioritize reaching for longer fingers and folding for shorter fingers. Common bigrams should be easy to type. Here’s a an illustration that I created grading the keys based on the approximate amount of difficulty/strain in reaching or pressing them with 1 being the easiest and 5 being the most strenuous. This grading scale takes into consideration the position of the keys, the strength of and length of the fingers and the staggered nature of the keyboard. Below is what it would be on an “matrix style” keyboard also known as “grid” keyboards. I call it the Workman Keyboard Layout in honor of all who type on keyboards for a living. And considering that today is Labor Day, I think it’s perfectly fitting. In Workman-P, the top-row numbers and symbols have been switched as well as the brace and brackets. It is great for programmers as well as system administrators. Left ring finger has slightly higher load compared to QWERTY, Dvorak, and Colemak. On Workman, the most often used keys are evenly and pleasantly distributed inside the natural range of motion of the fingers. It’s even better on a matrix style keyboard. Workman reduces overall usage of the two middle columns by about 50% over Colemak. This 50% reduction can be divided into two parts, horizontal and diagonal index finger stretching. 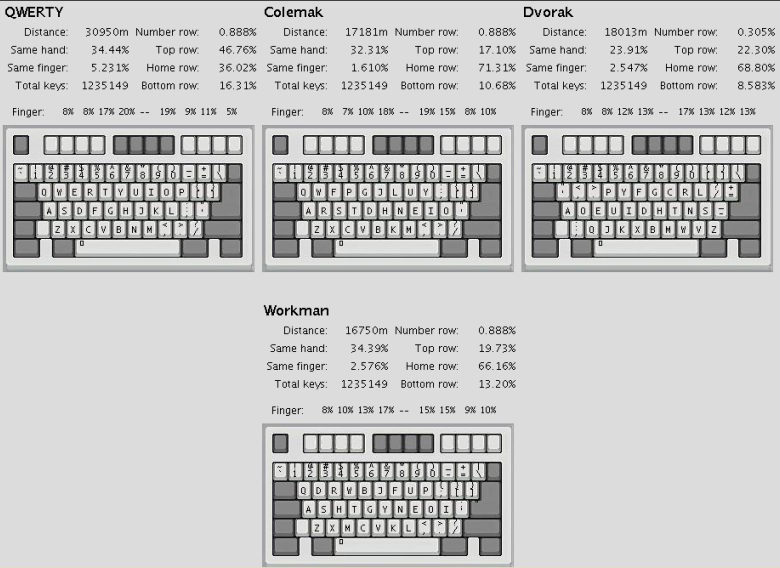 Workman reduces horizontal finger stretching by 63%, and diagonal index finger stretching by 27% over Colemak. This is because Workman efficiently utilizes other easy to reach keys instead of just placing them in the middle columns where they are difficult to reach. Workman also reduces vertical index finger stretching by 30% over Colemak by realizing that it’s easier for the index finger to fold than reach upwards. Looking at the first example. 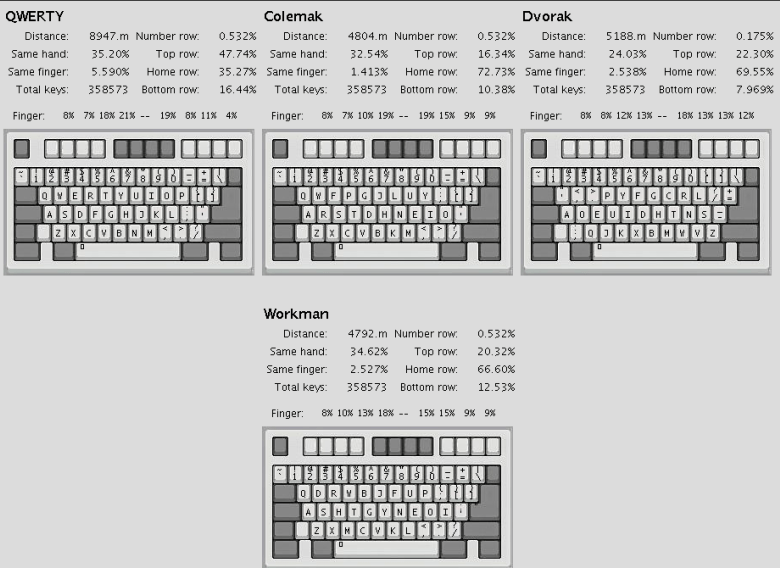 Colemak achieves the lowest overall finger-travel distance against QWERTY and Dvorak at 30,352 meters. However, Workman is even lower at 29,656 meters — a difference of 696 meters. It doesn’t sound like much, however if we convert it to centimeters, that’s equal to 69,600 cm. And considering that the distance between keyboard keys is approximately 2 cm, typing on Workman is like typing 34,000 less keystrokes than typing on Colemak. At 40 words per minute, that’s equivalent to approximately 3 hours of work. For Dvorak, it’s 126,000 keystrokes at 11 hours of work. And for QWERTY, it’s 1,369,800 keystrokes at 5 days of work. This shows how many times you had to do a double combo with one of your fingers. For example, typing the word “fuel” using Workman makes your right middle finger do a double combo because the letters U and E are both typed using the right middle finger. Here, Workman has an SFU of 2.185% which means that for every 46 keystrokes (approx. 9 words), one of your 8 fingers does one double combo. Compare that to QWERTY which is at every 20 keystrokes (4 words). Colemak is at every 58 keystrokes or (11 words). Workman, on average, has a higher SFU than Colemak… at +1%. Some people misunderstand and think that this somehow shows increased effort or discomfort. It doesn’t. Effort is the same, because no matter what, you’re still pressing the same number of keys. Comfort shouldn’t be a problem as long as the key is in a comfortable spot. The only thing that SFU might potentially and theoretically affect is speed because typing two letters with different fingers is a little faster than typing them with the same finger. However, I doubt that most people will have any problems with speed at all using Workman especially considering that very many people type very fast on QWERTY, of all layouts. In case you were wondering, the bulk of Workman’s SFU comes from these combinations: LY, OP, PO, CT, and UE. All of these combos are very comfortable to type with LY being less comfortable because the movement from L to Y is diagonal. Some people might say that this is a very bad thing but in reality it is not. First, LY occurs at about 0.24% of the time on average. That’s less than a quarter of one percent. To put it into perspective, for every 10,000 keystrokes, you will type LY only 24 times. At this rate, you will not even notice it. Even with this extra 0.24% considered, Colemak’s diagonal movements are still greater than Workman’s. Second, even though it’s a diagonal motion, you’re not really stretching that much because when you type L, you fold your fingers (storing potential energy), then you release it to type Y. The stretch is about the same as when you come from home row. It’s even less when you use a matrix style keyboard. Third, LY occurs at the end of the word almost all the time. This is important and it makes a huge difference. This means that when you type LY, you do it at the end of the flow of a word as a finishing stroke instead of being in the middle, which makes it less cumbersome. All in all, I don’t think this is a big deal. A better indicator of finger effort is the Finger Percentage. If you look at the Finger Percentages for Workman, Colemak, and Dvorak, nothing really stands out at first glance. However, Workman further reduces the load on the right pinky finger over Colemak and Dvorak. The right pinky, despite being one of the weakest, is one of the most used finger on a standard keyboard due to the location of the Enter, Shift, and Backspace keys, as well as additional punctuation keys. Both Colemak and Dvorak have higher right pinky percentage at 11% (253,850 keystrokes), while Workman is only at 9% (207,696 keystrokes). On Workman, your right pinky finger just typed 46,155 less keystrokes than both Colemak and Dvorak… that’s about 4 hours of work using ALL your fingers. Below are the average percentages for each hand. The two analyzers give slightly different results because they differ a little bit in how they do the calculations. However you still get the idea. 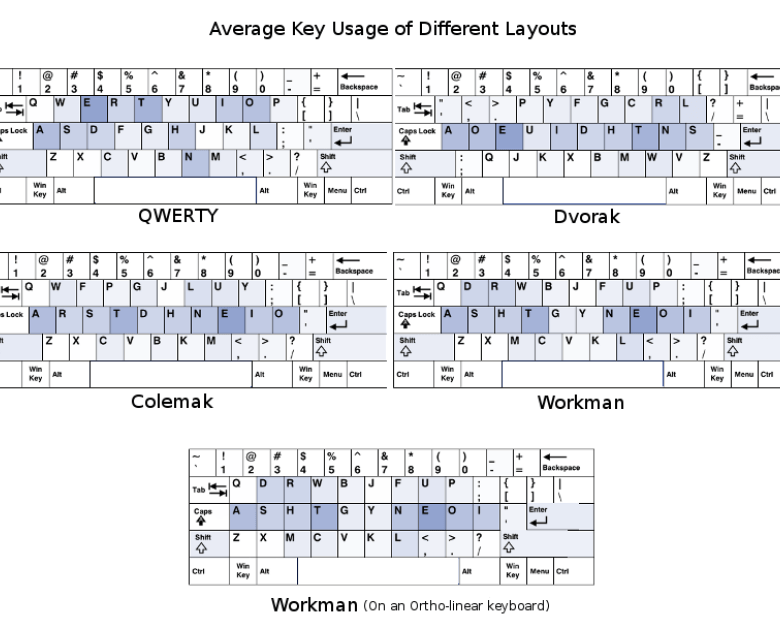 QWERTY has about a 4% lean towards the left while Colemak leans to the right by about 5%, and Dvorak, 7%. Workman balances the load between the left and right hands almost equally at 50%. Dvorak consistently gets lower Same Hand Utilization than QWERTY, Colemak, and Workman which are usually in the 30% range while Dvorak is in the 20’s. Dvorak was supposedly designed for low SHU which means that your hands alternate more frequently. Dvorak’s 20% SHU means that on average, you’re typing 8 keystrokes alternating between your hands, and the next 2 keystrokes, all in one hand as a combo. 30% SHU then means on average, 7 keystrokes alternating and then the next 3, all in one hand as a combo. In designing Workman, I preferred a high SHU (low alternation) over a low SHU (high alternation). I think high alternation is beneficial if you’re typing on mechanical typewriters but not necessarily on modern keyboards. On typewriters, it is very difficult to type combos with one hand because each key needs a large amount of force to depress. You actually rely more on the momentum of your arms and wrists to provide that force so alternating between your two arms is very helpful. However, this method of typing is inefficient on the modern keyboard because modern keys are easy to press. You are no longer reliant on each arm or wrist stroke to depress a single key. Doing so is actually unnecessary and a waste of energy. It is much more efficient to ride the momentum of a single arm or wrist stroke and type a combo rather than just one key. This way your arms and wrists potentially move less while typing the same number of keys, effectively killing several birds with one stone. In the beginning, this will not be apparent. However, as you become more proficient and familiar with the combos, you will be better able to utilize this advantage and type bursts of familiar texts in one hand using fewer hand strokes. An example of this is the word OPERATION. If you were to type this in Dvorak, you could type it as o-pe-r-a-t-io-n where each grouping is a hand stroke–a total of 7 hand strokes. Whereas with Workman, you’d probably be able to type it as o-pe-rat-ion using only 4 hand strokes. Typing Don Quixote, your wrists and arms potentially moved approximately 200,000 times less on Workman than on Dvorak. What these stats do not show is the usage of the middle two columns. 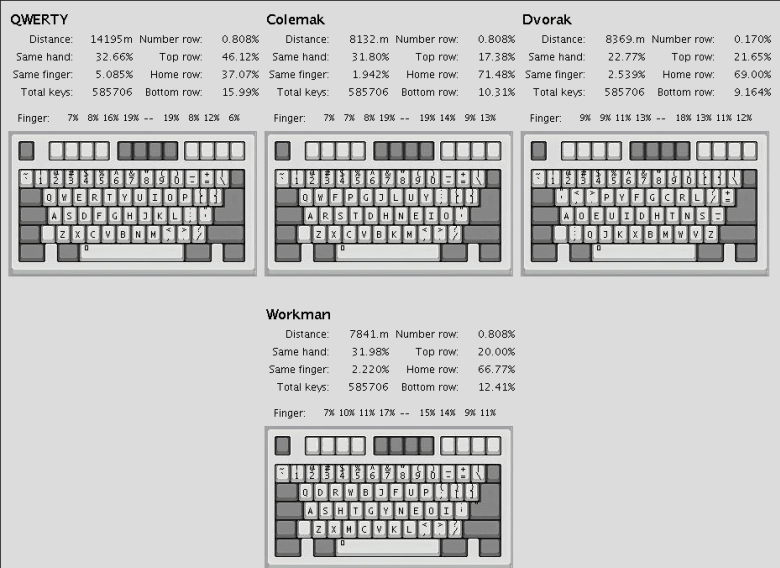 Colemak puts 280,850 keystrokes (12%) on the middle columns versus Workman at 125,875 keystrokes (5%). On Workman, your index fingers (and potentially your wrists) moved sideways 154,975 times less than on Colemak. Dvorak is at 308,533 (13%) and QWERTY is at 512,568 (22%). I encourage you to do your own testing and analysis. Note that different keyboard testers will give different results as to what layout is better depending on the criteria that they are using to do their measurements and assessments. Since Workman’s philosophy is unique, many testers will register it inferior to others. To do your own testing, you can use Patrick Gillespie’s Keyboard Layout Analyzer. You can grab full texts of public domain books here at Project Gutenberg. Can I use this layout? Sure go ahead! Feel free to use it if you would like. Below is a link to the implementation/installation files courtesy of David Norman (deekayen). IMPORTANT: The Workman Keyboard Layout is only a partial solution. Even the best keyboard layout could not completely remove the risk of typing injury. Typing in itself is an unnatural and hazardous task and no keyboard layout could prevent injury without proper precautions and common sense. I suggest learning to type with good hand and finger posture, taking frequent breaks, keeping your hands and wrists warm while typing, and using a keyboard that meets your needs. Our health, after all, is ultimately our personal responsibility. I hope that you’ll enjoy this layout and benefit from it. If you like the Workman Layout, feel free to tell others about it.